German Talmudist and author; born 1715; died at Hanover March 6, 1789. He was a son of the author of "Pene Yehoshua'," who died as rabbi of Frankfort-on-the-Main 1755. In his youth he was his father's assistant, and taught as such in the yeshibah (academy) about 1745-1750 (see his letters in Israel Lipschütz' responsa "Or Yisrael," No. 57, Cleve, 1770). Subsequently he was called as rabbi to Skala in Galicia, and in 1761 to Hanover, where he officiated until his death. Aryeh edited the fourth part of his father's work (Fürth, 1780), and added to it his own novellæ on treatise Baba Ḳamma under the title "Pene Aryeh" (The Face of the Lion). His own works are of the usual scholastic type. Aryeh was succeeded by his son, Issachar Berisch (1747-1807). 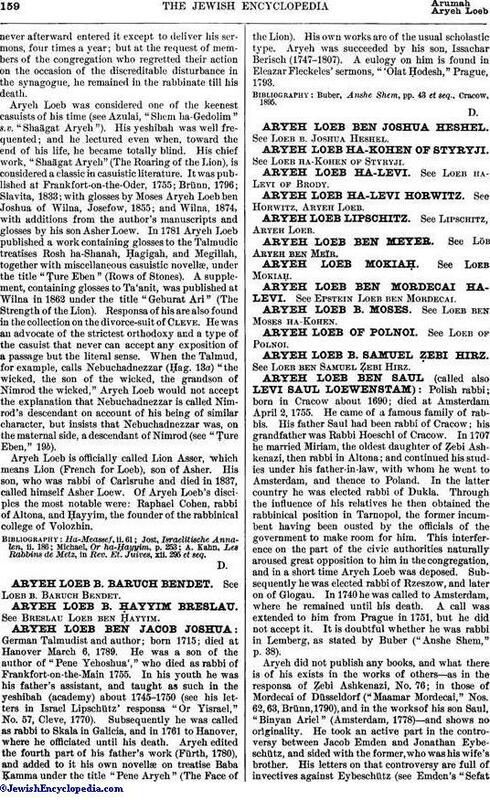 A eulogy on him is found in Eleazar Fleckeles' sermons, "'Olat Ḥodesh," Prague, 1793. Buber, Anshe Shem, pp. 43 et seq., Cracow, 1895.